Looking through the entrance way with millet growing nearby, into a homestead courtyard. Visible is a hut with an extended thatched entrance porch. To the left is a mud firescreen, known as buor, a large clay pot and drying heads of millet crop, also seen growing in the background. The film number suggests an Eastern Jikany homestead in 1935. Note on print reverse ms pencil - "83" & print front border ms ink - "NUER IX/2"
Morton, Chris. 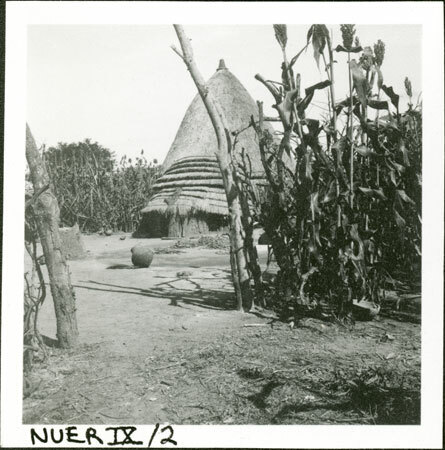 "Nuer hut and garden" Southern Sudan Project (in development). 03 Jan. 2006. Pitt Rivers Museum. <http://southernsudan.prm.ox.ac.uk/details/1998.355.398.2/>.